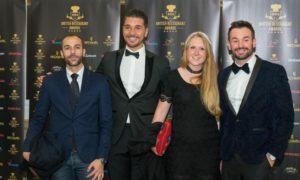 British Restaurant Awards , www.britishrestaurantawards.org (c) is a brand, company, event, tv programme, organisation and website operated by World Restaurant Awards Group. Registered address: 40 Bloomsbury Way, Unit 2, London WC1A 2SE¦ owned solely by WRAG and any re-productions, representations and breach in copyright will be subject to legal action within the following territories ; USA, United Kingdom , France, Germany, Africa, Switzerland, Australia, Europe and the Caribbean. Use of this website is open for worldwide users within the UK (United Kingdom) , Europe, Asia, Caribbean and the USA (United States of America) which will be the six initial territories licensed to organise, produce and broadcast the British Restaurant Awards. 1.) Only one vote is allowed per person. Voters must register with correct contact details as BRA staff will from time to time contact random voters to verify voting made. 2.) All VIP Tickets purchased are considered off the market. There are a limited number of tickets available and no refunds available for tickets already purchased. 3) Please note; you are able to vote multiple times from the same IP address as long as the votes are from pre-existing email accounts. This measure is to avoid an individual creating multiple accounts to increase their chance of winning. 5.) If a restaurant goes out of business before the deadline for voting. The winner is subsequently passed on to the second on the list with most votes. The copyright and all other rights in the material on this website are owned by us or are included with the permission of the owner of the rights. As a visitor to this website, you may download a single copy of the material on this website on a single computer for your own private viewing/listening purposes only. Single copies of pages from this website may be printed out for the sole purposes of enabling the person printing the page to retain a copy for their own personal records. No copying or distribution of material on this website for any commercial or business use is permitted without our prior written consent. No photography, filming, broadcast, alteration or modification of the pages of this website is permitted without our prior written consent except as may be reasonably necessary to use the website. Subject to this paragraph, all rights in material on this website are reserved to the British Restaurant Awards. The website might receive unsolicited material or images from contributors or readers which might be published. If you are copyright holder and if any copyrights have been breached. You will need to contact us by e-mailing : [email protected] and our policy is to take down the content within 4 days and this remedies the breach. * in any way that might infringe third party rights or that might bring British Restaurant Awards or any of its subsidiaries into disrepute. If you send any text, images, audio or other content to this website you accept that the files sent, and all rights therein, become the sole property of the British Restaurant Awards and that we shall have the right to use that content in perpetuity, throughout the world, in all known and discovered mediums and for all purposes and we shall have the right to make it available to the public on this website and otherwise. All material must comply with the rules on User Content Pages, set out below. We may require you to confirm the rights granted in this paragraph and where requested to do so you shall provide all reasonable assistance to us. The information on this website does not necessarily reflect the views and opinions of the British Restaurant Awards any of their brands. Neither should any suggestions or advice contained on this website be relied upon in place of professional advice. You are responsible for checking the accuracy of relevant facts, instructions, suggestions and/or opinions given on this website before entering into any commitment based upon them. 1. Promotions are open to UK residents aged 18 and over. As, the website is also accessible for our US audience via British Restaurant Awards. Promotions will also be accessible to US fans from 18 and over. 3. British Restaurant Awards reserve the right to substitute the prize for another prize of equal value. British Restaurant Awards reserves the right to vary these Terms & Conditions of Use from time to time. Such variations become effective immediately upon the posting of the varied Terms & Conditions of Use on the website. By continuing to use the website you will be deemed to accept such variations. A. Within these terms and conditions, any use of “We”, “Us” and “Our” means British Restaurant Awards.